When not on the road with his bands, blink-182 and Angels & Airwaves frontman Tom DeLonge always made it a point to read to his children, Ava and Jonas. 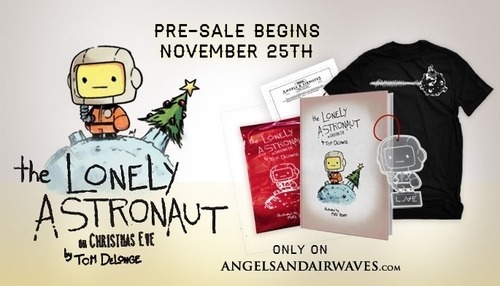 Now the punk-rock papa is proud to share some of his story time with the world, through the release of his first children’s book THE LONELY ASTRONAUT ON CHRISTMAS EVE. This book, written by DeLonge, is a wistful story for the young and the young-at-heart alike. Wonderfully illustrated by Mike Henry, THE LONELY ASTRONAUT ON CHRISTMAS EVE, is a tale of a rocketeer alone on the moon on a cold Christmas night, and the gift he receives from a few unexpected (and extraterrestrial) friends. To celebrate the spirit of the holiday season, DeLonge and Henry are proud to announce a charity auction to benefit San Diego’s Rady Children’s Hospital at CharityBuzz.com. Newer:AFI Announce 2nd Leg of USA TourOlder:Disfiguring The Goddess Reveals New Track "Industrial Quarter"